"She has to be the most racist leader in the world today. Not even Donald Trump can come close." "That woman has no heart and no sympathy with the plight of those poor refugees who are fleeing war and persecution in their homeland. Why must the Poles do this to the Arab world? What have we done to them? What is she afraid of?" "Every day in the Middle East scores of innocent people die because of violent conflict and all she can think about is preserving the racial homogeneity and culture of one small, insignificant European country? Isn't she aware that European populations are declining rapidly and that Europeans are not able to reproduce at a rate that can sustain the populations of the respective countries ? That is why Europe needs Middle Eastern men. We can reproduce at an alarming rate." "Terrorist attacks happen every day all around the world so what is happening in Europe lately should not be surprising. 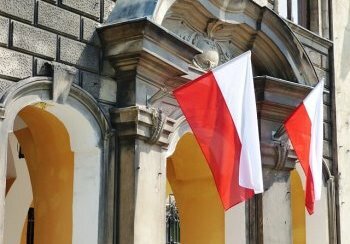 Poland should brace itself for one in the near future." "What is it with you Europeans? You are always wary about everything and everybody who are not like you. You people must stop being so bigoted and accept the fact that change is coming to Europe and there is nothing you can do about it." "Nothing we can do about it? You mean like preventing the so-called refugees from coming into our country so that our citizens can live in safety, like what Prime Minister Szydlo is doing right now?" An angry Gheit accused Kozlowski of being a "racist bigot just like your Prime Minister" and stormed out of the interview.